It’s surprisingly brutal for its time, with the severed hand scuttling about like it owns the place, flashing its stump brazenly. There’s a wet, meaty back view complete with wrist bones, apparently painted trompe-l’oeil fashion on the hand actor’s wrist, while the rest of his arm is blacked out. 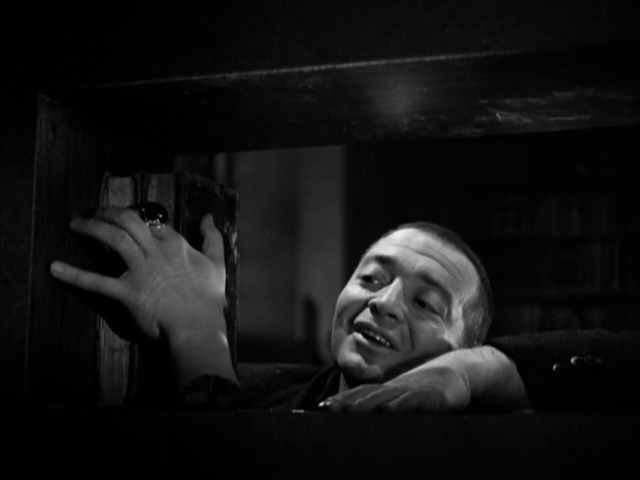 Apart from the various stranglings, it’s the hand who suffers most of the violence, crucified and burned by the neurasthenic Lorre (playing a character called Hillary, a mild-mannered name that doesn’t seem to quite suit him). The source novel surely owes a debt to Guy de Maupassant’s short story The Hand, which likewise plays with the idea of a disembodied hand strangling victims from beyond the grave, only to offer a not-quite-reassuring rational explanation. But we can go further back and credit the inspiration to Algernon Swinburne — when Maupassant saved the poet from drowning, he rewarded his rescuer with an ashtray made from a human hand. As you do. I have to presume that the young writer, sat at his desk, Gauloise in hand, casting around for inspiration, seized upon the first interesting thing to catch his eye. A good thing for French literature he didn’t alight upon his waste-paper basket made from a human arse, or his paperweight made from a fossilised spleen. In fact, Maupassant’s study was decorated with the disassembled parts of an entire human being, gifted to him by Swinburne. Possibly they were the parts of Swinburne himself. But astute readers will have realized I stopped telling the truth here some time ago, though they may be surprised to learn how late in the paragraph the fantasy takes over. Look, I made it a gif! It depicts Kay Kyser being violated by a stuffed gorilla. Yes, I *am* proud of myself. Why do you ask? 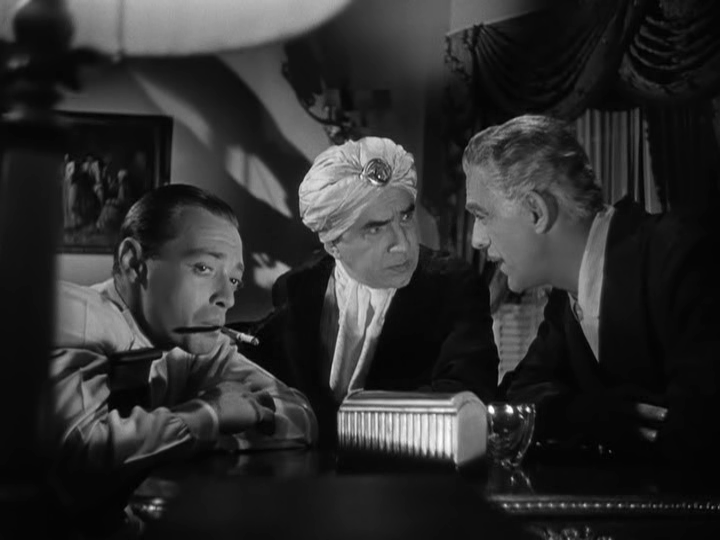 YOU’LL FIND OUT (1940) is worth resenting slightly because it unites Karloff, Lugosi and Lorre but is nothing but a silly comedy with not very good comedians. Kyser tries way too hard and isn’t funny. Sidekick Ish Kabibble tries less and is almost funny. 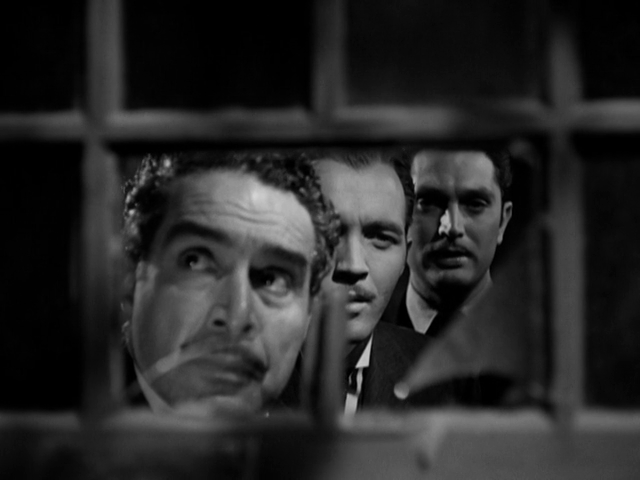 On the other hand, Kyser also stars in John Barrymore’s last film, PLAYMATES, so we should be lenient on this one. And none of the ghouls is embarrassing, in fact all get to do their accustomed stuff and do it well. They are the reason to watch. There’s also some fun stuff with electronic voice effects, Sparky’s Magic Piano style, which play a big role in the plot. I want to use this feature to decode the film’s writing credits. Director David Butler and James Kern are credited with the story, which is nothing much — an old dark country house spookshow with Scooby Doo explanation. Kyser and his band are playing a gig at this joint, so it’s like THE GANG’S ALL HERE with ectoplasm. Butler directed a lot of “zany” films which aren’t good like HELLZAPOPPIN. 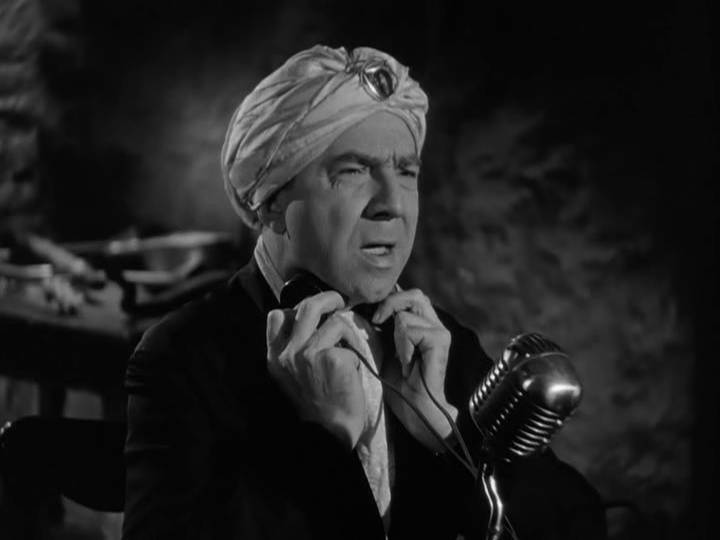 He worked with Kyser and with El Brendel and Eddie Cantor and did ROAD TO MOROCCO. Jerome Kern, a former attorney and singer wrote the script itself — I guess they needed someone with an education. 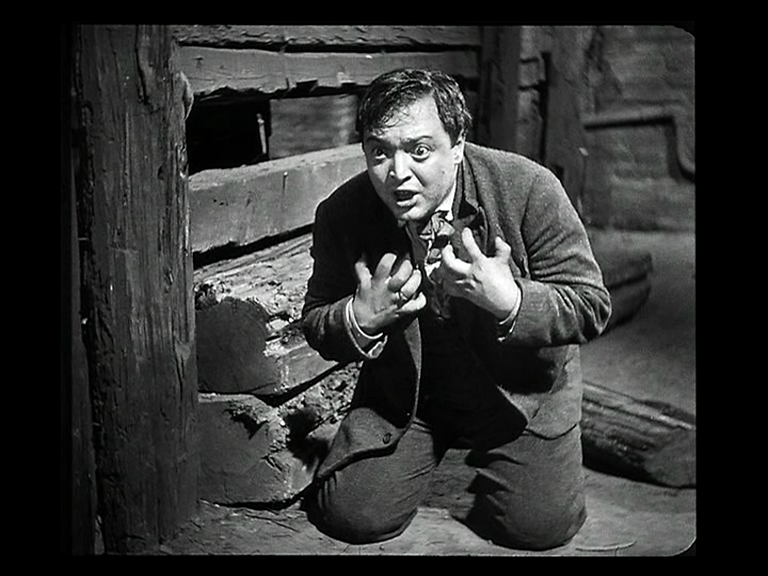 But three more schmoes are credited with “special material.” Monte Brice seems like a real Pat Hobby character, a silent era hanger-on with lots of vague credits for “story construction” or “special material,” mainly in comedy. One title intrigues: the lost WC Fields version of TILLIE’S PUNCTURED ROMANCE. We can assume it’s lost because it has an IMDb review by our old friend F. Gwynplaine MacIntyre. I suspect Brice may be responsible for the more visual-comedy material, such as the ape assailant above, and maybe the film’s one real inspired gag, the dog playing fetch with a stick of dynamite. 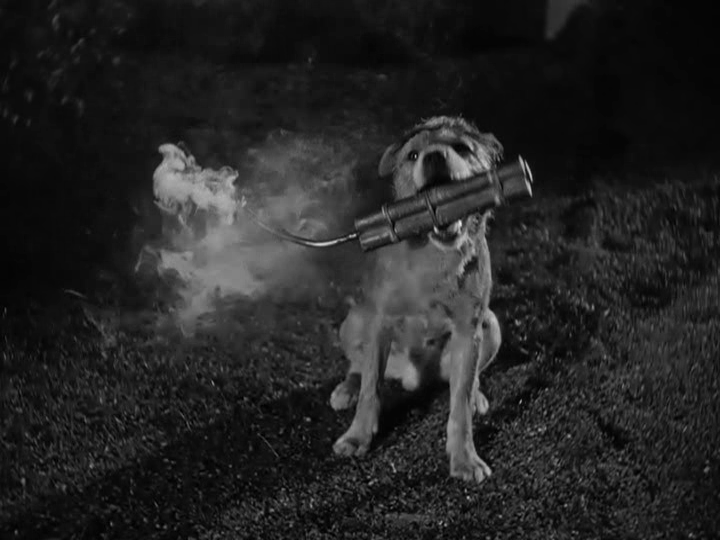 Comedy with real terror, as whenever the petrified comics hurl the high explosive away from themselves, the playful pooch brings it back. Andrew Bennison is also credited, and also has silent movies on his CV, but mainly as a titles writer, so I expect he was writing cheesy quips for Kay and Ish. And then there’s the mysterious R.T.M. Scott, who has no other screen credits at all. But I think I now who he is. Musician Raymond Scott worked with early electronic music. He also contributed tracks to David Butler’s earlier ALI BABA GOES TO TOWN. So I suspect he came up with the electronic vokes. I have no idea what the TM stands for though. Scott’s real name was Harry Warnow. The guy credited for providing the film’s “Sonovox” equipment, however, is someone called Gilbert Wright, so that confuses things. But my theory is that Scott knew of the Sonovox and suggested it to Butler as a plot device. This is of no importance whatsoever. Thank you for your time. My first and last trip to Berlin I recall trying to sleep in the day time in the Alcatraz youth hostel, where we guests of Britfest Short Film Festival had been placed after smarter accommodation fell through. I had been unable to sleep in this establishment for something like four nights and was almost starting to hallucinate. I lay on my bunk and could hear children playing in the street. German children. 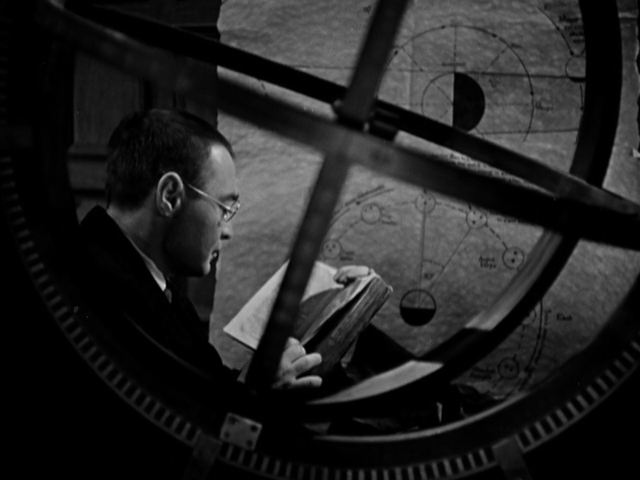 Which called to mind Fritz Lang’s M, and made me even less inclined to sleep. M is one of those seminal films I haven’t actually watched very often. When first introduced to it, I had a fairly normal, banal reaction to early sound cinema, reacting to the perceived creakiness, and particularly the unsteady lurches of the camera and the fact that the movie’s studio version of Berlin has no incidental traffic noise. That last fact is now one of the pleasures of the movie for me — I like how the whole film seems to have beamed down from space, with alien modes of behaving and strange, grotesque characters. I ran it for students last week and they got to experience the weirdness for the first time, but I seem to be past it. I’m *in* 1930s cinema now. The whole look of the movie’s world is incredibly beautiful to me — and yet many of the objects we see must have been quite commonplace. 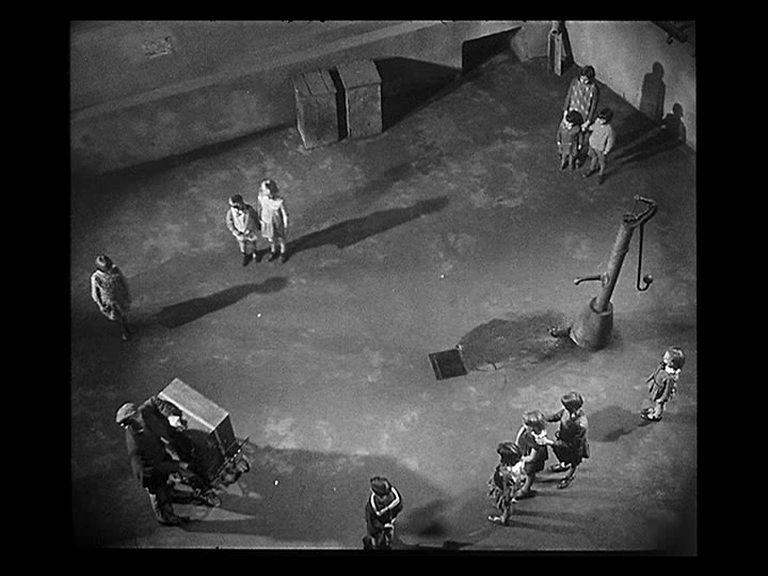 The water-pump that crouches amid the children like a preying mantis or an iron vulture is a perfectly naturalistic detail from a time when children played in tenement courtyards and every courtyard had a water pump. But it’s welcomed into the composition for its malign aspect. The drain set into the cement is somehow grim and suggestive of slaughter. 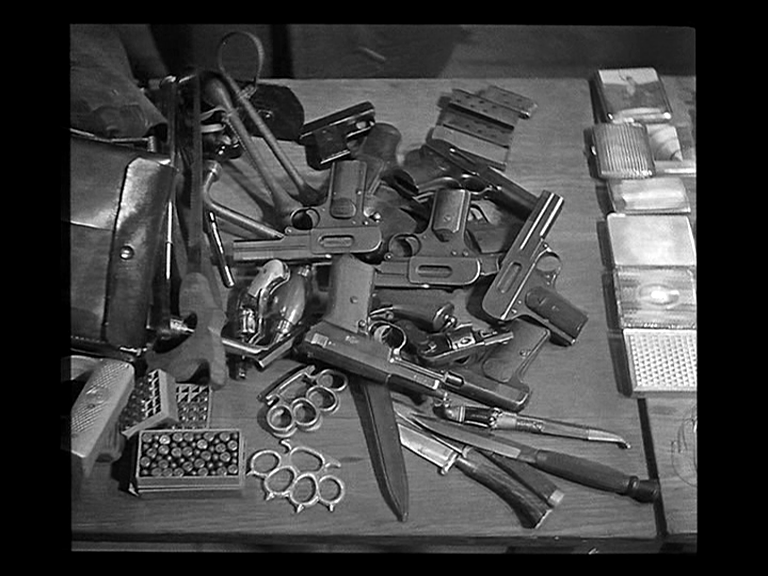 An aerial track along a heap of confiscated weapons made me think of TAXI DRIVER, and recall that Scorsese spoke of Lang’s influence on AFTER HOURS — tracking shots that make you feel locked into the character’s horrible destiny — so Lang surely must have been hovering over the earlier film too. (Scorsese’s overheads, which carry over into LAST TEMPTATION OF CHRIST also, are not like Hitchcock’s God shots, they are geometric like Lang, and dissociative like an Out Of Body Experience (O.O.B.E.). Who is the central character of M? Who’s side are we on? 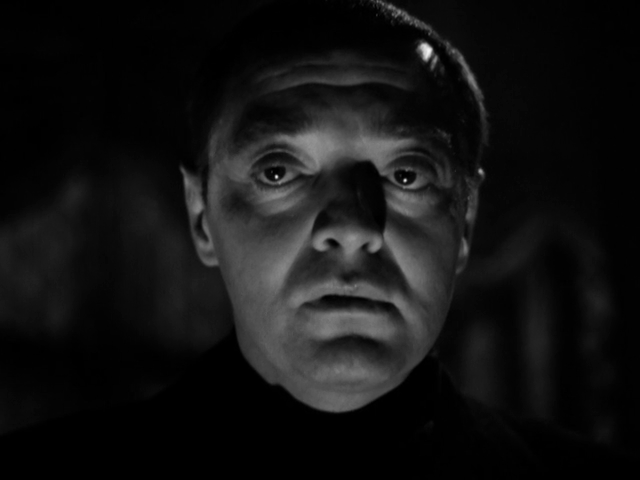 Sometimes the answer to both questions comes in the uncomfortable form of pudgy young Peter Lorre, but really it’s a movie about a society rather than an individual — as with THE BOSTON STRANGLER which mimics the structure closely, you could replace the killer with a virus or a weather formation. 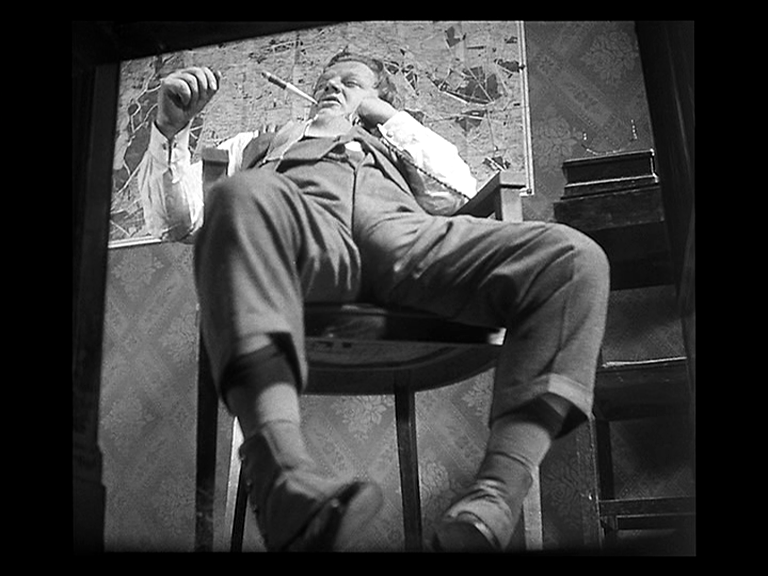 But despite a rather cool, detached view of its often appalling characters, many of them Georg Grosz cartoons made flesh, the movie is certainly not lacking in human interest. Oh, did I miss something — why do we get this angle? It seems to betray a frankly inexplicable interest in Otto Wernicke’s genitalia. The fact that Lang was, according to information received, possibly bisexual, in no way accounts for this.